Diel vertical migration of Euphausia lucens was studied over 72 h at an inshore and at a midshelf station in the southern Benguela upwelling region during February 1991, using stratified net tows and by employing gut contents (chlorophyll/copepods) as tracers of historic position. Soon after population arrival in the surface layers of the inshore station (abundant chlorophyll), E. lucens became dispersed and redistributed over depth. This was accompanied by a rapid downward transfer of surface-collected chlorophyll. A continuous exchange of individuals between deep and shallow water was subsequently inferred, prior to population descent at around dawn. These data are in agreement with the hunger-satiation hypothesis and were shared by individuals at the midshelf station (low chlorophyll). Interestingly, the major part of the E. lucens population at the midshelf station was confined to deep water throughout 24 h. While this conflicts with the hunger-satiation hypothesis, such behaviour is required to both ensure population maintenance and avoid surface predation within the Benguela region. 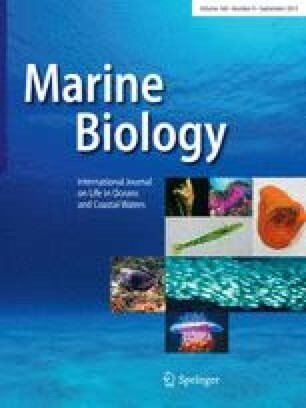 Although the examination of some recent literature suggests that asynchronous, hunger-satiation behaviours may be common amongst euphausiids in single-species assemblages, responses to the food environment may be constrained by other factors.